A recent study says that bottled-up emotions can be one of the causes for aggression. Most common causes have been found to be alcohol abuse, depression, mood swings, frustration, pre-menstrual syndrome, stress and type A personality. Aggression can manifest in physical bad behavior or verbal abuse. Name calling, shouting, nasty remarks, beating are signs of aggressive behavior. 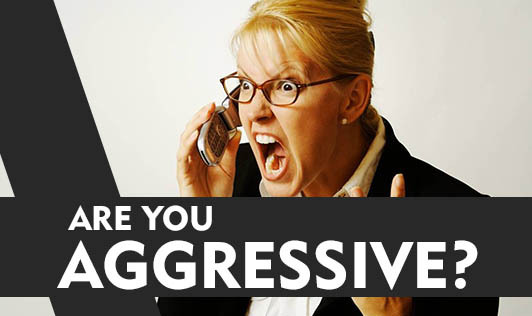 To overcome aggressive behavior learn to control your temper. Explore and analyse underlying feelings of hurt, anger or fear. Practice yoga, pranayam or meditation. Minimise expectations because failure to meet them can also make you frustrated and lead to aggression. Be content with what you achieve, unless you are ambitious and want to conquer the world! Find constructive ways to vent your anger rather than bottling it up. Be empathetic towards your family and colleagues. Choose to be assertive instead of aggressive. Involve yourself in social service in your spare time. Accept changes around you. If none of the above work, meet a psychologist or an emotional counselor to resolve your aggression problem.